The mission of the SGPS is to serve and represent the diverse community of graduate and professional students at Queen’s. In accordance with this mission, the event sanctioning process creates an environment in which ratified clubs and societies can organize events for their members while under the protection of their student government. The event sanctioning process allows these groups to register their events and, once approved, benefit from SGPS insurance coverage. This removes legal liability from event organizers for an incident that could not have reasonably been foreseen or prevented. All events must be registered, otherwise organizers risk the assumption of personal liability. However, low-risk events being held on campus or without alcohol should expect to be approved expediently. Riskier events, such as those involving alcohol, may require deeper review to ensure conformity with applicable SGPS and Queen’s policies. To submit your event for sanctioning, please complete the event registration form. Tired of the same events, year after year? Looking to add something new to your annual programs? There are multiple resources available to help spice up your events and create new ones! No need to reinvent the wheel! Borrow event ideas from student groups around Queen’s. Learn about their successful events, organizational structure, and fundraising ideas. Take it a step further and collaborate! Events can use a lot of energy and produce a lot of waste. There are actions that you can take throughout all steps of the planning process that will minimize the environmental impact of your event as well as save you money and add a new positive dimension to your organization’s image. Who will be the point person for this event? What day of the week/time of the year would be ideal? Come up with 2-3 possible dates for your event to be flexible when finding a location. Come up with 2 possible locations to allow for flexibility. How many people do you expect at your event? Make sure your expected attendance matches the room capacity for your location. What would be the ideal start and end time for this event? How much set-up and/or breakdown time will we need? Who is most likely to attend this event? Who is your target audience? Can you co-sponsor with another group, department or faculty? There is risk in any and all activities. That doesn’t mean that there is danger tied to any and all activities, it just means that everyone has to be mindful of what risks exist and the potential consequences of said risks. 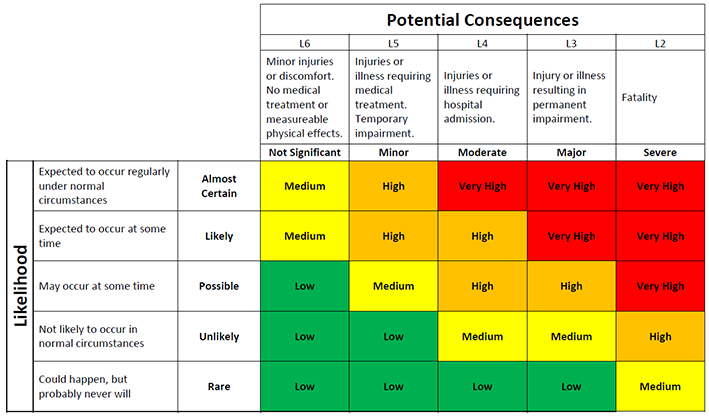 This is where a risk matrix comes in! Be honest in with your self and your group when assessing the risks. If you have any questions or concerns, contact director@sgps.ca for support. It is always best to pick a couple of possible dates for your event to have some flexibility when finding a location. When choosing possible dates, be sure to check out the University calendar and the SGPS events calendar for any potential conflicts with religious holidays, reading/final exam periods, or other campus events. Register your event with the SGPS using this form. Registering your event with us allows for you to receive resources and support, if needed. Once you have submitted your event it will be forwarded on for review. Events must be registered at least 10 business days prior to the date of your event. The following checklist will help you in planning your upcoming event. Use this checklist—in order— throughout the planning process to keep things on track. Register your event with the SGPS. Registering your event with us allows for you to receive resources and support, if needed. Once you have submitted your event it will be forwarded on for review. Events must be registered at least 10 business days prior to the date of your event. Is your event on campus? Reserve a Space through Event Services. Does your event require you to sign a contract for a venue, equipment rental or a performer? Submit your contracts via email to director@sgps.ca for review and signature. Students are not allowed to sign contracts on behalf of their organization, the SGPS, or Queen’s University. Request Payment For All Artist/Vendors. Reserve Security (events that have alcohol may require security). Explore Alternative Transportation Options (If the audience for your event will be traveling off-campus, research alternative transportation options such as taxis, private busing or Kingston Transit). Secure Volunteers (Have group members sign up to make themselves available should anything occur during the actual event). It is not only important to promote your events, but it is critical to promote your group as a whole. There are a number of ways to publicize a group on campus such as social media, the Queen’s Event Calendar, and department/faculty specific listservs. Contact your department for information how to access your specific listserv. How do you know if the audience enjoyed the event if you don’t ask them? Consider a survey! Comment cards are an option for “come and go” events. If you know your guest list, obtain email addresses and send out an online survey or e-comment card. FluidSurvey is a great survey tool that all Queen’s students can access for free. Answer the following questions honestly to provide feedback for future events. Keep this information on file for future event planners within your group. How many people attended this event? Did more or less people attend this event than you expected? What methods of marketing/advertising did you use? How effective were these methods? What went well with the planning and implementation of this event? What problems did you encounter when planning and implementing this event? If you organized a green event, did you meet all of your goals for reducing waste and promoting sustainability? You can find the Queen’s Hospitality Services food request forms here. Groups will no longer have to formally register but they must be recognized departmental or faculty societies, or clubs ratified under their ambit. Sober volunteers are required, particularly to liaise with the venue or another external group involved with the event. The approval process for Queen’s Hospitality Services is outside the control of the SGPS. It is expected that individuals who are registering events with comply with Queen’s policies. Individuals holding current First Aid certification will be required for high intensity physical activity events. For low intensity events, it will be optional. When there is a grey area between high and low intensity, the SGPS Executive Director will advise whether First Aid is required based on the information in the event registration form. Sanctioning for events outside of Kingston or events out-of-province will be determined on a case-by-case basis. If possible, getting insurance directly through the destination is the most viable option.